The water has cleared up a bit and the warmer weather has got the fishing turned on good. 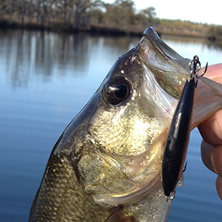 Crankbaits and other shad imitators are working really good on the bass, along with soft plastics (senkos, lizards, etc). There are reports of redfish being caught along the causeway, so if you're bank-fishing now would be a good time to try em there. Tight lines everybody!